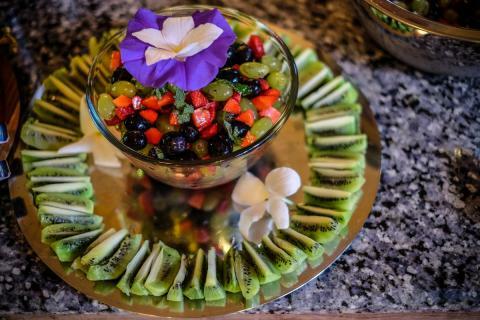 When you book a retreat at Samata, you will have the ability to customize your menu based on dietary needs and retreat schedule. We will uphold the highest standards of hygiene in our beautiful kitchen, using fresh organic ingredients from our Organic Garden and other sources. Two vegetarian meals a day are provided during your retreat, as well as access to the Mango Communal Kitchen for tea, coffee, and fruit in case you need a snack. The reviews so far from our retreats this season have been very positive in regards to all the food and meals coming from the Amrit Holistic Kitchen. We are very blessed to have Tess Rosenbush crafting organic Ayurvedic culinary delights. Vegan and gluten free meals are available upon request.